I’ve entitled this Style Challenge simply because this is so very different from what I normally do. I feel it’s very important to try different techniques and looks. The whole idea of art, and cardmaking is an art, is to stretch beyond what you feel is comfortable and safe. My inspiration comes from this beautiful piece of art from Oopsy Daisy. There are many fabulous forms of art on this site and no doubt that’s why Anne chose it for the the Inspiration Challenge over at Splitcoast. I’m also using this for the Free For All Challenge from Friday at Splitcoast. Our fearless leader, Wendy, gave us a list of Funky and Fun July Holidays…I chose Creative Ice Cream Flavors Day. This represents Chocolate, Strawberry, Banana. Perhaps not so creative but yummy! And, this is also for the Ways to Use it Challenge from Thursday at Splitcoast…Something Old, Something New. My something old is my watercolor paper and my inks, and my something new is a stamp set from Tim Holtz. 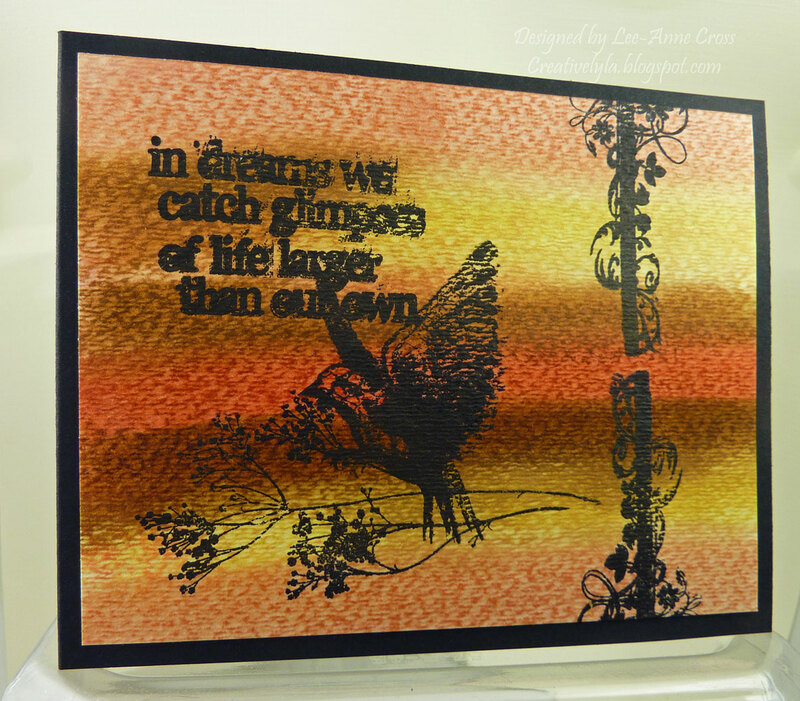 The cardbase is a standard A2 in Basic Black from Stampin’ Up. I took a piece of cold press watercolor paper and sponged on several different inks to mimic my inspiration piece. Then, I spritzed the paper with water and added more color. Next, I stamped all the images in black including the sentiment. And finally, I dried the paper with my heat gun. Have a fantastic holiday weekend! Previous Previous post: Mousy birthday! Lee-Anne Cross Designs Blog at WordPress.com.